This post may contain affiliate links. See our Disclosure Polilcy . Here’s how to clean a Keurig — or get yours working like new again. If your Keurig is brewing slowly, shorting your cup, or won’t work at all, don’t throw it away until you’ve tried these tips first! 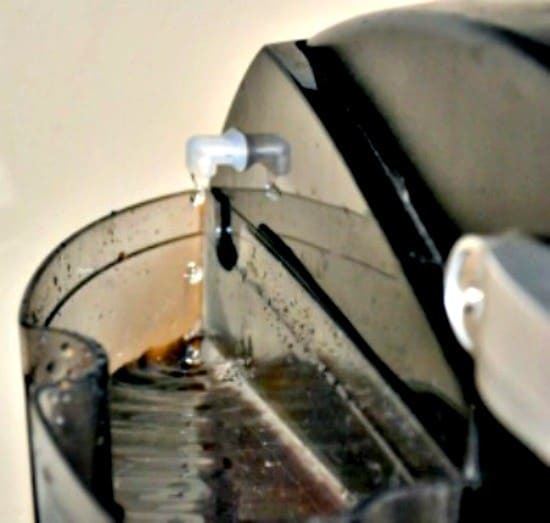 This method has helped thousands of people clean a Keurig coffee maker to get theirs working like new, even when they thought them broken. I wonder how many people have thrown away their coffee makers because they didn’t know how to clean a Keurig, particularly one that doesn’t pump water anymore? I nearly did just that, too, when my Keurig wouldn’t work after I’d stopped using it for a while. Figuring it was broken anyway, I decided to try a few things to see if they helped. Sure enough, just 30 minutes later my Keurig was working better than ever. Before we get started, please note that if you have electrical problems like a display or lights that don’t come on, this is not for you. In that case, contact Keurig’s customer support line at 1 (866) 901-2739. If your machine is still under warranty, they’ll replace it for free. 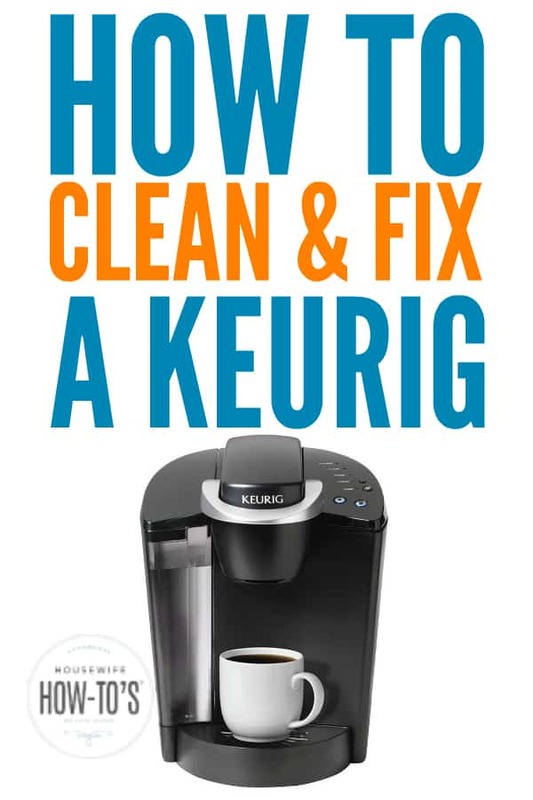 For those who want to know how to clean a Keurig, or get their broken one working again, read on! The following steps work on all Keurig machines. They will clean and fix a Keurig, even one that’s been shorting cups or not brewing at all. 1. Unplug it. I can’t emphasize this enough: unplug the thing! 2. Disassemble it. Remove the water tank and its lid, along with the stand that supports your cup. Open the top and remove the K-Cup holder — that’s the insert which pops out. Wash these pieces with warm, soapy water and dry them thoroughly. 3. Unclog the needles. Grab a paperclip and partially unbend it. 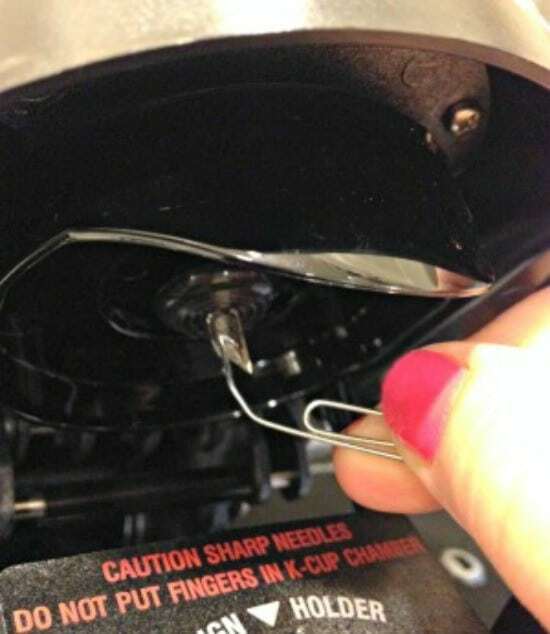 With the Keurig’s top open, carefully insert the free end of the paperclip into each of the three holes along the needle that pierces the K-Cup. Jiggle the paperclip around then remove it. Don’t worry about harming your machine: there are no working parts here, just holes that get clogged with scale and debris. If using a paperclip concerns you, commercial cleaning kits containing individual pods will accomplish this same step. One reader reports that you can contact Keurig at 1 (866) 901-2739 and they’ll ship you a free tool to do this. Personally, when my coffee maker isn’t working, I don’t want to wait for days to fix it. So I did the rest of this and, voilà, it worked like new again. 4. Turn it over and whack it. Turn your machine completely upside down and, with the top open, give the bottom a few smacks with the palm of your hand. Crazy as it sounds, this helps loosen debris. It’s best to do this over a sink since tapping will dislodge buildup that’s been preventing water flow within the machine and may lead to a rush of water coming out. NOTE: A reader points out that you need to wait after unplugging it to let the water in the machine completely cool before turning it over. Thirty minutes should do it. 5. Clear the tube. With the machine still upside down, put a drinking straw over the spout. Wrap this juncture with a paper towel to make it as close to air-tight as possible. Now, blow as hard as you can into the straw to force air through the Keurig spout to dislodge scale buildup in the water line. Some readers have asked if it’s safe to insert a pipe cleaner in this tube. I wouldn’t recommend it due to concerns that the wire within the pipe cleaner could puncture the water tube. Others have asked whether it’s sanitary to blow on it. You’ll be using vinegar to descale in a moment, and vinegar has germ-killing properties. 6. Wipe it clean and reassemble. Grab a lint-free cloth and clean the cup holder and the outside of the machine. Return all of the parts to their places. 7. Descale it. Fill the water tank with half water and half white vinegar. You may have been told to use straight vinegar, but that can harm the machine due to vinegar’s high acidity — keep it at a 50-50 mix, or use a commercial Keurig descaling product . Immediately begin running the vinegar-water through the machine until you’ve emptied the entire tank, dumping each cup as it brews. If your Keurig doesn’t run without a pod in the holder, insert a used one. By the time the liquid comes out, the vinegar-water will already have done its job, and it won’t matter if leftover coffee or tea drains along with it. You won’t be drinking this, anyway. 8. Run clean water through it. After you’ve run an entire tank of vinegar water, repeat the above step at least twice using only water. Check the final cup to make sure there’s no vinegar taste, and run more fresh water through if needed. To test whether you’ve got all of the vinegar out of your Keurig, one reader suggests sprinkling a pinch of baking soda into the final cup of water: if it fizzes there’s still vinegar in the system, so you’ll need to run more clean water through it. • For most households, performing steps 7 and 8 above every three months will keep your Keurig working wonderfully. If your machine gets heavy use (in an office setting, for instance), you might want to perform all of these steps monthly. • To reduce buildup in the future, switch to filtered or distilled water. • If you prefer reusable Keurig pods , be sure to wash them in hot, soapy water regularly to prevent buildup. Scrubbing them with an old toothbrush helps, too. • Any time you brew something besides coffee — such as cocoa, chai, or soup pods — run an extra cup of plain water immediately afterward. This will keep sugars and other materials from building up in the dispenser and slowing down your machine. • Before going on vacation, unplug your Keurig and empty the tank. After 30 minutes, drain the device by turning it upside down over the sink. Now that you know how to clean a Keurig and fix a broken one, you can go back to enjoying your morning jolt of caffeine! I really thought the motor was gone bad in ours but followed your cleaning instructions and voila! It works again! Unbelievable! I used the paper clip and nothing felt clogged or came out. Maybe it was the 5 or so smacks on the bottom that did the trick 🙂 Thanks so much for sharing! Thank you so much!!! My husband was on Amazon getting ready to buy a new machine when I found this!!! It worked perfectly! OMG! You’re a genius! Thank you for helping me fix my machine. I have an unhealthy attachment to my coffee. I’m glad to have been of help! I can’t start my day without coffee, and the Keurig makes it so darned convenient. I really do love that thing. I like my keurig very much. I have had 2 pumps die within the first year of owning them. Both never indicated to be cleaned by showing the “descale” command. Keurig is fantastic to deal with and both times shipped me a new machine within days. I use softened water that is also filtered from my refridgerator. The 3rd machine has worked for two years now. I think it is a new improved and better pump. It is much quieter. These cleaning tips are spot on. A good pump can’t pump well through clogs. :). Good day!! Keurig does have great customer service! My machine has never nagged at me to clean it, either. My other coffee maker, OTOH, seems to nag at me every couple of days. Ugh. I’m not a housewife; I’m an old geezer. But your how-to sure saved me a heap of trouble. I’ve had my Keurig for a few months, and today the pump seemed to die. I had seen this article copied on Lifehacker, so I followed your instructions. I had to vary them because I have a Vue model. The needles have grooves, not holes, but they had gunk on them that needed scraping. I ran through about a quart of vinegar water, and now the machine seems to be working fine again. Thank you very much. Very glad it helped, Lane! Loved this post! I had tried vinegar with water and flipping the machine upside down. I even attempted to unclog the needle and still the machine would only drip water. I found this post and followed your method step by step and would you know I can now make fresh coffee. It seems there was a lot of coffee grinds clogging the needle. I even saw some debris shoot out the straw as the machine was brewing. No longer need this cleaner solution, taking unopened bottle back to the store. Thanks so much!! You’re quite welcome. Thank you for taking the time to let me know it helped! HI! i have used this method before, (except the straw part, guess I missed that) and it always worked. However, I am descaling right now for the THIRD time in 12 hours, letting it sit for 4 hours like the manufacturer said. Still it says descale. This will be the only time descaling after trying the paper clip and straw tricks though. I don’t know what else to try….. The straw trick is interesting because the over flow tube that brings water back to the tank has a check valve so if you try and push air through that it won’t go through. Perhaps you can explain what I am doing wrong? The fault seems to be lack of pressure to push the water through the pod. Or perhaps the check valve is clogged so bad it won’t work in either direction. Forget the Keurig! I went old school and got a percolator and bean grinder best coffee I ever had! I got a 9 cup Corningware at a flea market, there’s tons of them on Ebay cheep. Absolutely! We bought a small Farberware percolator and have never looked back. Fast, hot, tasty coffee. I completely agree about the superiority of percolated coffee. I’m just incredibly impatient. I follow the “cold water only for all cooking” because hot water contains lead. It takes longer but if it keeps the lead out, it’s worth it. Hot water only contains lead if you have lead in your pipes. Hot water is more likely to loosen lime and other mineral buildup in the hose, though. OTOH, I suppose you could look at it that as a form of vitamin supplementation. OTOH, ugh. Starting with cold water makes the coffee taste much better. I believe the instructions tell you to use cold water too. I’ve been using my percolator for 30 yrs, love it!! Hi Katie! Thanks for getting back to meツ We have the Special Edition K69/K65 single serve. I set mine up the night before so since I am always the first one up I just have to push down the handle, press the button, go to th’s bathroom and when I come back, it’s done and I just put the creamer and sugar in and I am good to go. I inspected the reusable cup and saw the fill line. I don’t buy loose tea. Too expensive right now. I would ♡ to and I know it would be best and open up a whole new world for me but right now I got my ‘stash’ of Twinnings and Bigelow. I do have loose leaf of Earl of Gray from Twinngs(I just bought it first the tin. I ♡♡♡ tins!) . I willl also try opening the tea bags. Your tea doesn’t come out weak from not steeping for 3-5 minutes, Katie? I will try removing the K-Cup holder like you said…yes too easy lolツ and give it a go. Daily I give the whole machine a wipe down because it seems a lot of dust settles on it for some reason and there is always coffee residue in the K-Cup chamber. These steps should work with your model, from what I’ve been able to see online. I hope you and your family enjoyed a wonderful Easter, too! I am going to purchase an infuser as I did try the tea in the Keurig and didn’t really care for it either. Again, thanks for these tips. You’ve been most helpful ツ and I have ordered the tea you suggested-I cannot wait to try it! OMG! I am amazed! I thought my Keurig was broken but this worked! Thank you! Thank you! THANK YOU! I am a tea snob, and make my tea the old fashion way – in a tea kettle. So did not expect much from a “coffee machine” to make my tea. But let me tell you how happy I was when we got the Keurig…it was as great for tea as it was for coffee. I use loose tea in the reusable cup and it is fast and easy. I have also used tea bag in the cup as well, but loose tea is the best way to drink tea (told you I was a tea snob) and there are a few companies on-line that have a huge assortment and they are pretty inexpensive compared to many of the tea places I used to frequent for my loose tea purchases. Try “Enjoying Tea” on-line. They have the most amazing Creme Earl Grey! They also have discounts all the time and with each order you get a 15% coupon/password to enter each time you order until it expires, usually a few months. Love the Keurig, but have used a French press as well for tea. I cannot wait for the weather to cool off so I can start enjoying my tea every evening! Cheers! I love tea, too, Cheryl. Iced or hot, winter or summer – I love it all! Will definitely check out the Creme Earl Grey. Thank you! I agree the The Twinings Tea is definitely the best tea ever & love trying all the new flavors that come in the Kcups. Thanks for this. We just got our Keurig in January and we bought the reusable k-cup because we knew we couldn’t afford to always by the k-cups. Lately, the Keurig has been jipping me on my coffee. We always use the button farthest to the right to brew the coffee. We have a Pure water filter on our tap because we live in the city and we use that water in our Keurig because you’re suppose to use purified or bottled water in your Keurig or your going to break it. Anyways, how do you get the k-cup holder out of it? How much loose tea do you put in the k-cup? Can you use tea bags in the k-cup? I haven’t even used tea in the Keurig? Thanks for this. I will definitely be using this today to clean our Keurig. I look forward to your answers. Thank you. As for loose tea, my reusable filter has a “fill to here” line, so I…fill to there. You can’t use tea bags, but if you have a tea you like that’s in bags I suppose you could cut them open and dump them in the holder. Then again, microwaving is probably easier. I buy my tea loose, in bulk and organic, with a Subscribe & Save discount via Amazon. My favorite is this one , which combines chamomile, cranberry, roobios, rosehips, hibuscus and orange peel. It’s divine! We just run it without a k-cup in it. It dispenses hot water and we just dip the tea bag right in the hot water. Sure it’s not much different but it’s easier and faster than nuking the water. Lately I’ve been using the Double Bergamot Earl Gray cups. They are delicious! Just stuff the tea bag in the holder. The round tea bags are best for this. My tea comes out tasting delicious. It’s that easy? I’ll have to give it a try. Thank you, Diana! To remove the the insert put your finger on the bottom of the insert and push up.to put back line up white lines at the top .. Look at both before taking apart so easy ..
You’re right, Rosa. That’s exactly how to do it. That’s kind of the entire point of these steps. Have you followed them? All of them? I’m glad it helped but sorry about your husband’s coffee! This is why the Tassimo is superior. I have had a keurig for a while and decided to try the tassimo. What a hassle it was to make a coffee. I only made one then sold it and kept using my keurig. If the Tassimo is superior, why are you reading about Keurigs? My coffee keurig does not give a whole cup of coffee It seems that the water is not getting through to pod I don’t know how to tell it to you I have taken it apart and cleaned it but nothing seems to work. If you’ve tried each and every one of the steps, including the turn  tap as well as the straw trick, then it’s probably just dead. If it’s still under warranty, Keurig will replace it for free. I just had a similar problem today. It had plugged up during the regular cleaning and no water would come out. I did all the standard cleanings but still no water came out. I took the machine covers off and removed the lines from the check valve. I first made sure water was coming from the tanks. Sure enough, water everywhere. I then used a turkey baster (a glass one) filled it with water and attached it to the line leading to the pump. I pushed the water in and used the bulb to pull water in and out. I pulled out an amazing amount of scale out of the machine, close to a quarter cup. One note here, I had the vinegar/water solution in the machine and it had soaked for about 5 hours before I started this. I continued this with fresh water each time until there was no more scale in the water. Ran it and it works like new. There was so much scale built up I think it had just completely plugged the machine up with the heavy white scale. I ran 3 reservoirs through the machine and it’s working great again. I love my Kurig this was my first and I must admit I neglected it. I have a new one now and this one is just a back up so I had no reservations about ripping it apart to try and fix it. It was worth the time. I think this one is going in my office now. How did you take the machine covers off without breaking them. And you don’t mean the base do you? No one is suggesting to remove the covers! The parts you see in the photo are all removable. The water tank is the one you remove to fill before making coffee. The lid is the one on the water tank. 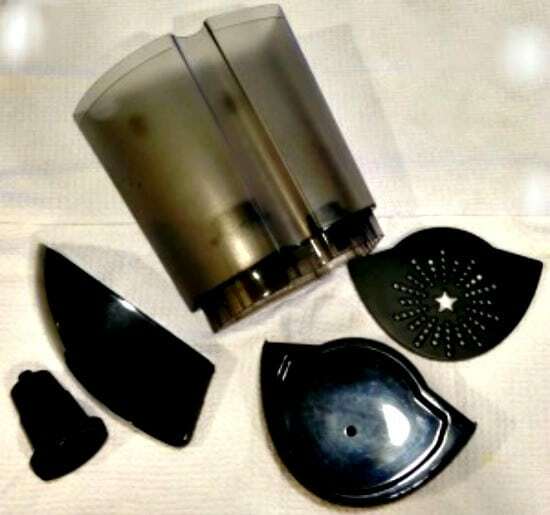 The base in most Keurigs does come off should be removed and cleaned regularly, anyway, since it catches drips. Check your owner’s manual and you’ll see the parts of your machine that can and should be removed for cleaning. Thank you!! You saved me from replacing my keurig ???? We’ve paired popular flavors to put more coffee in your brewer and leave more green in your wallet. Having problems with your Keurig K-Cup Brewer? Repeated usage can cause functional issues, disrupting your coffee drinking experience and the quality of your coffee and tea. The good news is there are a number of ways to fix these problems and get your machine to function as good as new. Here are five common Keurig troubleshooting solutions and easy ways to correct these problems. Keurig Troubleshooting Solution: Remove or clean the needle that punctures the K-Cup Pod then do a small cup cleansing brew to clean out any residual. This will ensure any left-over debris is flushed out before you have you start your next brew. Keurig Troubleshooting Solution: Remove the water reservoir and insert it back into place. The magnet in the reservoir can become dislodged during brewing from the vibrations in the machine. Keurig Troubleshooting Solution: Simply add more water to the reservoir. All Keurig Brewer models need a minimum amount of water to activate the brewing process, so if you’re reservoir is low the machine will not start. Use these five Keurig troubleshooting solutions for your machine and you’ll ensure your coffee and tea always taste great and your brewer lasts a long time. 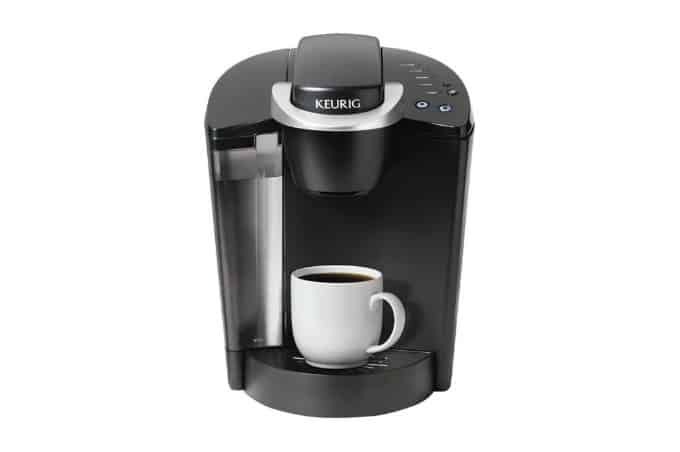 As a result, you’ll save yourself time and money not having to replace your Keurig K-Cup Brewer. When I brew a cup of coffee, it only brews a half a cup. Why? After being unplugged for 10 days, my Keurig wont stop pumping water once turned on again. I have tried holding down the brew button, unplugging again and re-starting. The same things happens all over again. HELP!